Plenty of ink has been spilled on David Brooks channeling of poor little Paulie Ryan’s bruises. All of the scorn and ridicule is fair. David Brooks is an innumerate hack propelled by some actual skill, but lots more good luck and well timed sychophancy into a position of influence in which he can do real damage. But I don’t want Brooks’ jaw-dropping:”let’s do lunch” inanity to obscure the fact that the column as a whole is almost a type specimen of the kind of fundamental intellectual dishonesty that characterizes his work pretty much across the board. My usual response to something like this would be roughly 4,000 words of high dudgeon. ** Real life intervenes however, to everyone’s benefit, so I’ll just hit a few of the high spots in a column so full of wrong it could power Sarah Palin’s teleprompter for a year. The first, and in some ways the most significant failing in this piece actually does emerge in that “why won’t mean Obama coddle some guy who’s trying to kill everything his administration has done.” The high Broderism is obvious — did anyone ever doubt that Brooks was going to grab for Broder’s mitre with all the ravenous zeal of a hyena in an abbatoir? But the deeper problem lies with what Brooks reveals here of how he views his relationships with sources. For many reasons I share with our own Aimai a reverence for I. F. Stone. As she and I have discussed him off-line, one of Stone’s most significant attributes was his view of sources. They were tools, in the neutral sense of the word…not friends, never people whose regard for you mattered. My idea was to make the Weekly radical in viewpoint but conservative in format. I picked a beautiful type face, Garamond, for my main body type, and eschewed sensational headlines. I made no claim to inside stuff—obviously a radical reporter in those days had few pipelines into the government. I tried to give information which could be documented so the reader could check it for himself. I tried to dig the truth out of hearings, official transcripts and government documents, and to be as accurate as possible. I also sought to give the Weekly a personal flavor to add humor wit and good writing to the Weekly report. I felt that if one were able enough and had sufficient vision one could distill meaning, truth and even beauty from the swiftly flowing debris of the week’s news. For Brooks — not so much. The implication running through his work, and certainly the offending column — at least as I read it — is that we, his readers, should accept Brooks’ authority because of his personal connection of Paul Ryan, that emotional understanding that enables Brooks to grasp Ryan’s (notional) interior life, his beliefs and motivations. That’s not how its done. In fact, a desire to be welcomed and valued by the players condemns one to being played. It’s a death sentence if your goal is to do journalism, to be someone who can recognize and reveal uncomfortable truths. Once you care what the people whom you cover think of you, you’re finished. In Brooks’ case, it seems to me that he consciously conspires in his own capture. But even so, there are costs that he can’t avoid. Much of what is stupid and wrong in his work (and there’s a lot of it) derives from the way he’s convinced himself that what he believes and feels is true, before or without ever delving into the facts behind the feelings. His “friends” assure him of his wisdom, which seems to be good enough for him, and the result is that odd feeling of weightlessness and divorce-from-reality that threads through his increasingly forgettable work. For some examples, just from this one column, let’s look at Brooks description of the five things that Paul Ryan believes. First, he believes that aging populations, expensive new health care technologies and the extravagant political promises have made the current welfare state model unsustainable. Fundamental reform is necessary or the whole thing will collapse, here and in Europe. Second, he believes that seniors and the middle class cannot be excused from the benefit cuts that will have to be imposed to rebalance these systems. Third, he believes that health care costs will not be brought under control until consumers take responsibility for their decisions and providers have market-based incentives to reduce prices. Fourth, he believes that tax increases should not be part of these reforms because the economic costs outweigh the gains. Fifth, he does not believe government can nurture growth and reduce wage stagnation with targeted investments. There is the overt problem that these “beliefs” are brought to us not from Ryan — no quotes, no links to speeches, no nothing — but rather from Brooks himself, playing the ventriloquist. This is a conventional hack novelist’s trick: you put all the best speeches — the ones that convey what you really think — into the mouth of the character you like best (see Galt, John, e.g.). When Brooks uses that strategic term, he is saying that what matters is what Ryan accepts as true, not what is. The moment one lets the spell of his easy-listening prose break, though, it becomes obvious that Brooks wants us to then draw real world conclusions based on these “beliefs.” Once that shoe drops, it becomes clear that one can — and thus must — put Brooks’/Ryan’s claims to the harsh test of empirical tests. Which, because of reality’s well known liberal bias, is not pretty. For example: until Ryan, and Brooks, can explain why the Scandinavian countries are able to deliver first class health care and outcomes at lower cost to all their population, the first of the Ryan articles of faith must be judged false. Brooks might argue that it is clear from context that this not something he’s claiming himself — it’s still what Ryan believes. But the effect of slipping a bald line like this into the midst of a list of contingent claims is to give that one statement more authority, and Brooks is too skilled a writer not to know this. The point, of course, is to advance a claim not in evidence in the hopes that no one will ask him for its bona fides. I’m asking…or rather I’m telling him that the collapse he predicts is far from being a law of nature. “The math” tells us no such thing. Second, it once again conflates a fiscal issue with one of substantive policy: there are approaches to containing cost that examine, for example, the incentive problems that arise from paying by the procedure and not the patient. Here Brooks, using Ryan as his ventriloquist’s dummy, takes as given that the only path to cost control is a broad benefit cut. Again, on the face of it, a lie. (Note, I’m not saying that health policy alone can reduce the rate of medical inflation; just that the assertion that there is only viable approach to doing so — radical rationing (old poor people must die) — is based on nothing but ideology contradicted by experience. Obama does not believe in relying on market mechanisms to reduce health care costs. Instead, he would rely mostly on a board of technical experts, who would be given power to force their recommendations upon Congress. Two things: note the asymmetry between “does not believe” and “would rely…on.” It would be correct to say that Obama recognizes that market mechanisms are one tool to control health care costs — this is why, for example, he viewed health care exchanges as a critical element in the health care reform. It would also be correct to say that Obama’s administration, like most Americans, understands that the “market” in health care is so far from that economist’s spherical cow, the “free market,” as to require real regulation and oversight — in which that independent board would play an important role. It is wrong to say that Obama’s administration sees that board as its primary tool for cost containment. This cod-on-a-slab flopping around in an effort to paint an utterly economically conventional President as some socialist dupe highlights Brooks’ problem: modern conservative economic, policy and social ideas are based on a religious commitment to a few revealed ideas. To defend them is difficult-to-impossible if one actually does the work to see what, say, actually happens to revenues at different tax rates (number 4 in the theses that Ryan/Brooks nails to the door above). So, if you are Paul Ryan you simply ignore the data of the last thirty years, and if you are David Brooks, you happily serve as an amplifier for such fictions in the service of the false narrative. In itself that sentence is an insult to poor Alexander Hamilton, whose grasp of English prose was sufficient to avoid contradicting himself in the space of a score of words or so. But it’s real purpose is not to make sense, nor to make a meaningful historical connection. Rather, it is, again, to put the willfully know-nothing Brooks in a position that the reader will accept as above the fray. But facts do matter. And that is why friends do not let friends get misled by David Brooks. **So it’s roughly 2K. Sue me. ***I’m not going to go medieval on the other sin Brooks commits here: conflating medical care for the aged and the disabled with “welfare” as it’s been popularly maligned. Welfare has already been framed as theft by the (undeserving) poor (with all the overtones of race and crab-barrelling that form such a large part of the Koch-ist propaganda machine). Social insurance, available and availed on by all is something that the American people by a wide margin (unsurprisingly) tend to value. The hope of the right is that such support could be undermined by the guilt-by-association burden that would come if somehow we could all be persuaded that the provision universal health care to the aged is somehow going to lead to more moochers eating my steak or something. Brooks is trading in such class/race war code words here, and should be ashamed of himself. Which statement, of course, also contains an assumption not in evidence: that Brooks possesses the capacity to experience that emotion. 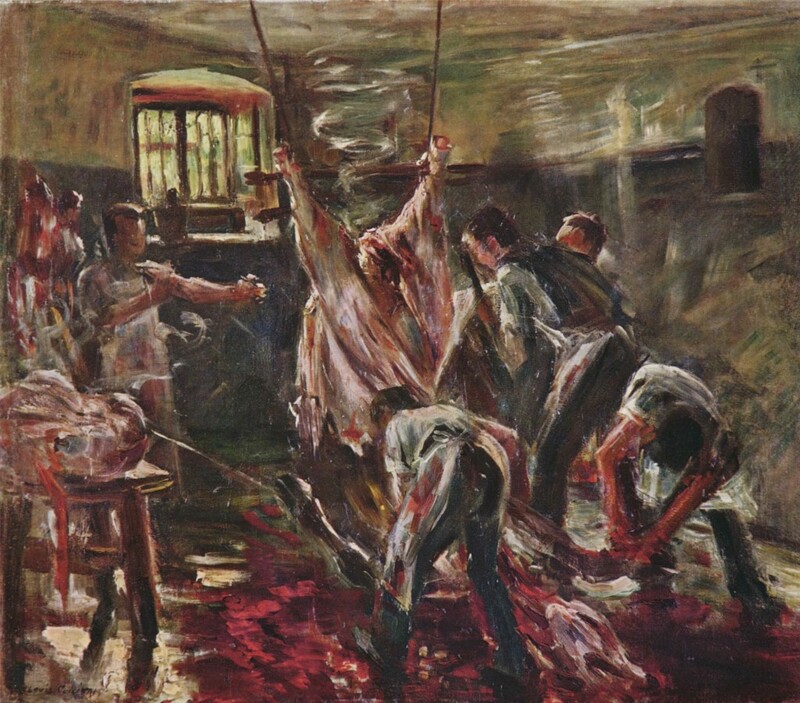 Images: Lovis Corinth, In the Slaughterhouse, 1893. 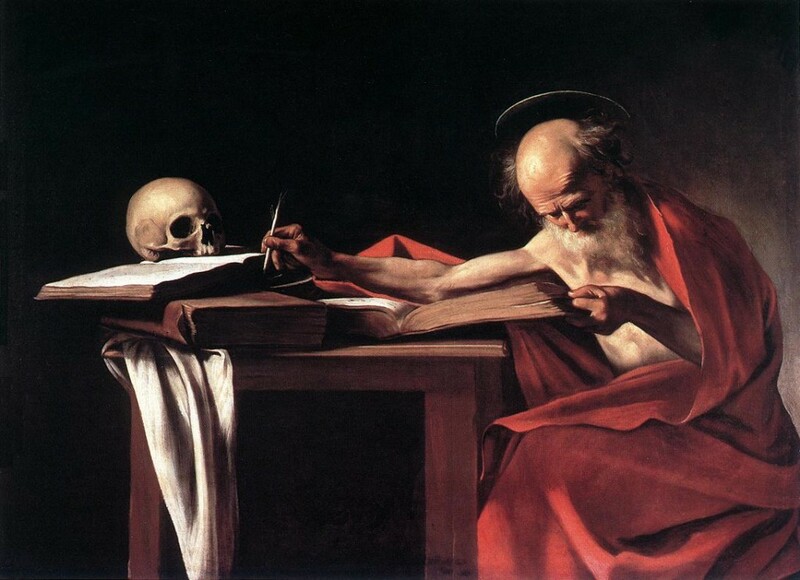 Caravaggio Saint Jerome, c. 1605-1606. This entry was posted on April 18, 2011 at 10:27 am and is filed under bad writing, deceit, Decline and Fall, Republican knavery, words mattter. You can subscribe via RSS 2.0 feed to this post's comments. Ryan, on the other hand, is hard right. Lunch won’t settle matters, as this post clearly shows. …one could distill meaning, truth and even beauty from the swiftly flowing debris of the week’s news. I will say that I find Brooks remarkable in one way, and you have mentioned it. Throughout his history with the Times, he frequently couches his blathering with a tone of sincere, personal reportage. And, moreover, he is clearly deeply in need of the feeling of being accepted by the male, rigid, reactionary figures he interprets. (Stott, Buckley, now Ryan…) I wonder if he has an analyst whose office we could burgle?